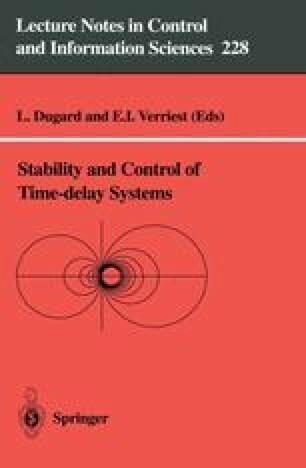 This chapter considers the problem of output feedback stabilization of continuous time linear systems with a constant time-delay in the state. We develop a delay-dependent method for designing linear dynamic output feedback controllers which ensure global uniform asymptotic stability for any time-delay not larger than a given bound. The proposed stabilization method, which is based on linear matrix inequalities, is then extended to the case of uncertain polytopic systems. We also consider the problem of delay-dependent robust stabilization via output feedback for state delayed systems with norm-bounded parameter uncertainty. In this situation, the solution is given in terms of a generalized eigenvalue problem. The developed stabilization methods can be implemented numerically very efficiently using existing convex and quasi-convex optimisation techniques.